For over five thousand years, henna has served as a symbol of good luck, health and sensuality in the Arab world. 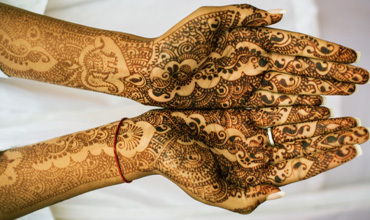 In ancient India Vedic custom of henna is centered on the idea of “awakening the inner light.”Henna tattoo are temporary tattoo best suitable for any of your upcoming events, fashion shows or specials. The indo western style tattoo designs are widely used over hands and feet of ladies on various occasions to create a style avowal of your own. Henna paste is safe to use, skin friendly and provides dark and deep color. The inevitable question – Threading or Waxing or Tweezing?